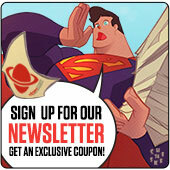 Celebrate 100 Years of Jack Kirby at TFAW.com! Jack Kirby is a true visionary, creating dozens of iconic characters that are still in use today. From heroes like Mister Miracle and Orion to nefarious villains like Darkseid and Kalibak, Jack Kirby was in a league of his own. Even though Jack passed away in February 6, 1994, join us as we celebrate what would have been his 100th year. On this page, you'll find comics both written by Jack Kirby and a hand-picked selection of some of the best modern comics that use his characters. Get ready to find out why Jack Kirby was "The King of Comics" with these fantastic comics and graphic novels! 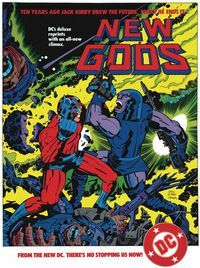 The Best of Jack Kirby! Jack Kirby is a true visionary, creating dozens of iconic characters that are still in use today. From heroes like Mister Miracle and Orion to nefarious villains like Darkseid and Kalibak, Jack Kirby was in a league of his own. Classic Kirby Tales For Only $1! Legal Notice: Entire contents trademarked (® or TM) and copyrighted (©) 1986-2019 by Things From Another World, Inc. and respective copyright and trademark holders. All rights reserved. Page rendered at 2019-04-19 07:42:42 in 0.293 seconds.